If children or adults catch measles, mumps or German measles, complications of all three infections can cause hearing loss. Only German measles can be passed on to an unborn baby to cause congenital deafness. Thirty years ago it was common for children to get German measles and this was actively encouraged. The problem with getting German measles as an adult is that it is generally more severe, making you feel very unwell and it can also pass across the placenta and harm an unborn baby. Pregnant women used to avoid anyone who might have German measles and the possibility that they would catch it caused a great deal of stress. Children born with German measles often suffered severe hearing loss and had problems such a cataracts, blindness, heart defects and problems with learning because of brain damage. In the 1970s, a national immunisation program began to vaccinate against German measles, which is also called rubella. The rubella vaccine was given only to girls. In one way this made sense because only girls get pregnant but it is not an efficient way of creating what is called herd immunity. By leaving half of the population unvaccinated, there is still a large pool of people who can pass the virus that causes rubella, enabling the infection to persist. Although there has been a lot of controversy about it, the MMR vaccine is now given to all children, boys as well as girls, at around 13 months. 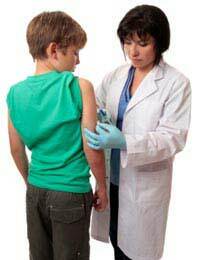 This vaccine provides immunity to mumps (which can cause sterility in men), measles and rubella. The controversy has arisen because of claims that the MMR vaccine might be associated with autism but many large studies have looked into this and found no evidence for the link at all. Children with autism generally don’t start to show recognisable symptoms until after the age of 13 months, so the signs of autism can coincide with the period just after the vaccine is given. This is coincidence, according to a large body of evidence, rather than a causal effect. If you are planning to become pregnant and know that you have never had German measles, and you think you may not have had the vaccine either, it is a good idea to ask your GP or midwife to arrange a blood test to see if you have good immunity to the rubella virus. If you don’t, you can choose to have the MMR vaccine but make sure that this is well before you are likely to be pregnant. The vaccine is not safe to have whilst actually pregnant. As well as preventing your unborn child risking deafness, you will also avoid a significant risk of miscarriage, which infection with the rubella virus also causes. Measles is not as common now as it used to be because, again because of the MMR vaccine. Although children and adults who catch measles can develop hearing problems because of the nerve damage that results from encephalitis (swelling of the brain), a potential complication of measles, measles does not seem to cause congenital deafness. Unlike with rubella, there is no evidence that measles can infect the unborn baby and result in a higher risk of hearing loss in childhood or even in later life. Mumps is similar to measles in that if can lead to hearing damage due to encephalitis, meningitis or other complications but it is not associated with a higher risk of congenital hearing damage. Having the MMR vaccine as an adult to protect you from rubella will also enable you to avoid some other problems that can result from mumps infection when you are an adult. About one in 5 of all men who get mumps after they have gone through puberty suffer severe swelling of the testicles, which is extremely painful and can leave them infertile. In about 5% of adults with mumps, the pancreas can become inflamed and women can also suffer inflammation of the ovaries. There are worries about vaccines but it is important to keep a good perspective. The actual disease in all three cases is more dangerous than the vaccine, both for you, your prospects of having a family and to reduce the risk of passing on an infection to your unborn baby.